Safe on rubber, plastic, vinyl, cloth, etc. The Meguiar's Citrus Fresh Cleaning Wipes will allow you to quickly clean various surfaces with an easy to use and dispose of cleaning wipe! Dust, dirt and grime can build up fast on your interior surfaces. Don't reach for your cleaning spray and microfiber towel though, instead grab these wipes, simply wipe down the desired surface and throw out the used wipe! Each container contains 25 pre-moistened wipes that will leave your car clean and smelling fresh. These wipes remove dirt, grease, grime, etc. and are safe and effective on various vinyl, rubber, plastic and cloth surfaces. They come in a convenient travel tube so you can leave them in your car in case of those dreaded emergency situations. 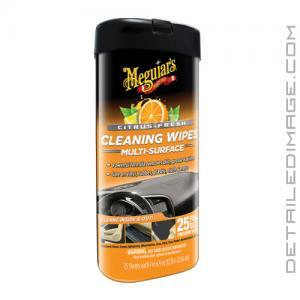 When trying to clean with simple, easy to use wipes, the Meguiar's Citrus Fresh Cleaning Wipes are an awesome choice! Meguair's Citrus-Fresh Cleaning Wipes were developed after decades of experience creating multi-purpose cleaners used by professional detailers and automotive enthusiasts around the world. Exterior surfaces like running boards and trim are constantly bombarded with road grime that washing doesn't remove. Interior surfaces like carpet, upholstery, door panels and dashboards get dirty from daily wear and tear. Meguiar's Citrus-Fresh Cleaning Wipes are the perfect product to use on both the inside and outside your vehicle to easily clean those surfaces that are constantly getting dirty while restoring that like-new appearance with a refreshing citrus-fresh scent. For best results, apply to a cool surface. Test for color fastness and compatibility on a small inconspicuous area.